One of the oft-mentioned reasons for the slow free-agent market this winter is that teams are thinking on the same wavelength when it comes to evaluating players. One of the tenets of this theory is that free agents are bad bets because of the aging process. As players age, especially after 30, they get worse on the field, and teams don’t want to get stuck with those decline years. There is a whole lot of reason in that explanation for the offseason’s lack of activity. There’s also a little bit of faulty logic regarding the aging process, particularly when it comes to this year’s free-agent class and the two biggest names out there, Eric Hosmer and J.D. Martinez. The first flaw in this argument is based on a misunderstanding of how clubs are compensating players. All teams — and especially the “smart” ones — know and understand that the final year or years of a free-agent contract are unlikely to be valuable in terms of strict wins-per-dollar calculus. It’s generally accepted that those “out” years are going to be mostly dead weight. Players are typically signed to deals for which the total guarantee is equally distributed over the course of a deal. The team isn’t paying an equal amount every year expecting metronomic production over the life of a contract. They expect to receive a surplus of value in the early years and a deficit in latter years. The hope is that the early years compensate for the latter ones. Teams could, in theory, pay players a greater amount at the beginning of a contract than at the end, but most clubs choose not to do this because, by spreading the money out, they get to keep more money now and having money now is more valuable. If a team doesn’t want to add, say, a seventh year at $25 million to Eric Hosmer’s offer, it isn’t because they believe he isn’t going to be worth $25 million in that seventh year. It’s because they believe he won’t be worth extra $25 million over the first six years. The value in the seventh year is going to be close to zero in terms of expectations. That’s not the main point I’m trying to make in this post, but it does deserve a mention. 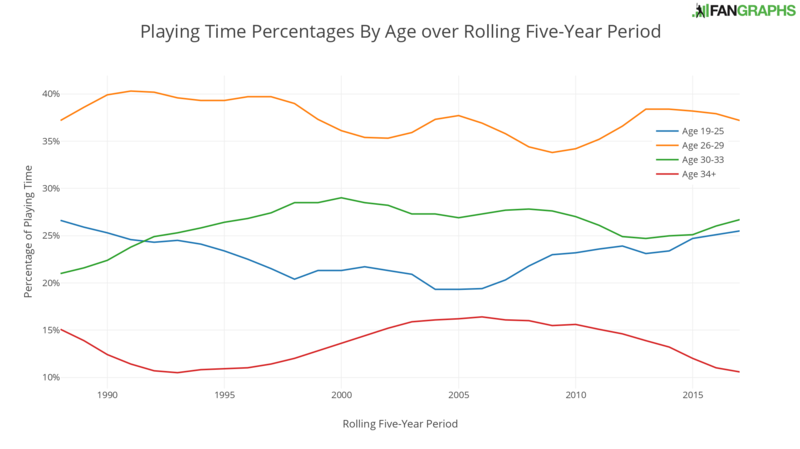 The main point of this post is to show how playing time and production has been divided by age group over the past 30 years. 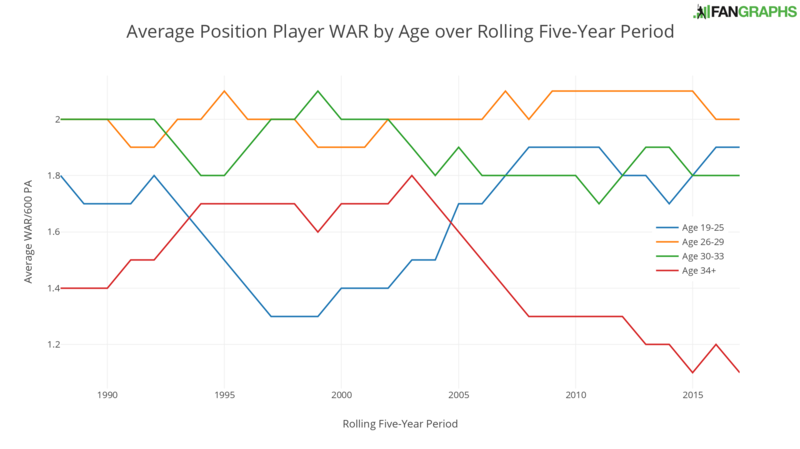 I went back to 1984 and looked at five-season rolling averages based on age group and broke position players out in three categories: plate appearances, WAR, and WAR per 600 plate appearances. First, let’s look at how playing time has been divided up over the years. For every year on the graph below, it encompasses data from that year and the previous four — e.g., the year 2017 denotes the stretch from 2013 to 2017, while 1988 includes 1984-1988. In terms of playing time, players in the traditional prime years (ages 26-29) feature the highest allotment of those present here. That has remained fairly consistent for a while, in the 35% to 40% range for all seasons. This makes sense: the players who populate this age group are typically at their best relative to their younger and older counterparts — and to the younger and older versions of themselves. At the bottom of the graph, we see the oldest players (ages 34 and over) in baseball. The playing time for this group has seen pretty significant fluctuation over the years. In the mid-1980s, older players received about 15% of all plate appearances. That figure went down with the addition of four expansion teams 90s, then way up during the PED era. The figure has come crashing back down over the last few years. What’s interesting here is that players who have just left their prime (age 30 through age 33) haven’t necessarily followed the same pattern as that slightly older population. When expansion came, the players in their early 30s actually got a greater slice of the pie in terms of playing time. That trend continued through the PED era, as well. Over the last few years, that group hasn’t lost much in terms of the gains made over the previous decades. Now, in fact, they’re near a high-water mark. Meanwhile, the youngest group saw playing time go down during expansion and the PED era, but has come back very strong over the last decade. The chart above tells us about opportunities but doesn’t say much about performance. The graph below shows the share of WAR by age group. Despite a change to the y-axis, this chart looks pretty similar the to the one above. A brief examination of the two graphs might lead one to believe that, on a rate basis, the performances of the different age groups have remained similar over the years, with playing time representing the major different in terms of on-field value. Please note the ranges of the axes here, though: while the playing-time graph begins at 10%, this second one begins at 5%. The older players are doing a whole lot worse. We’ve actually witnessed pretty wild fluctuations over the years in terms of the quality of play provided by different age groups. Young players, however, have never been better than they are right now. There are several possible reasons for that. Perhaps teams are waiting until players are truly ready to play and have success in the big leagues. Perhaps clubs are doing a much better job of developing talent in the minors. Or maybe it’s a question of context: a lack of access to PEDs in the minors might have precluded younger players from their benefits, even as older players prolonged their primes by means of their use. While we’ve seen younger players improve relative to the members of other age groups, those working in their prime years (26-29) haven’t experienced much change. The group of players just past their prime has endured only a minor dip. As for players age 34 and beyond, they have seen their production plummet. Older players have seen their playing time and their production both cut nearly in half since the height of the PED era. 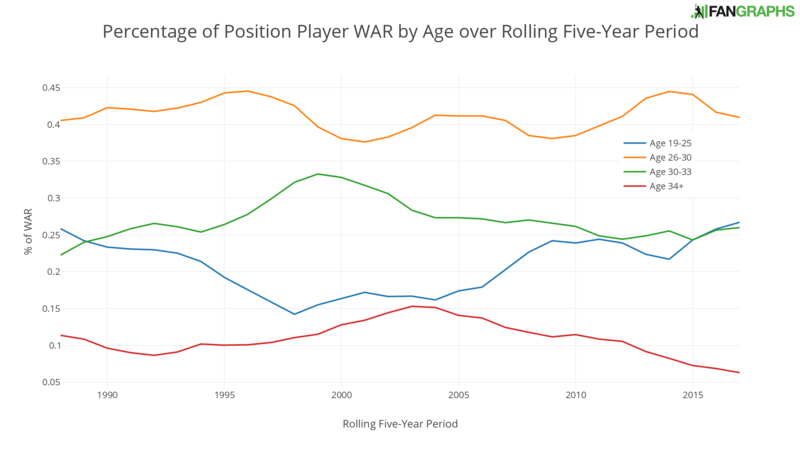 From 1999 to 2003, players 34 and over were responsible for 15% of position-player WAR. The last five years, they’ve accounted for just 6%; last season it was under 5%. Per 600 plate appearances, the oldest position players in the league produced only 0.8 WAR per 600 plate appearances. Yes, players generally decline in their 30s, and it is certainly possible that the tail end of the aging curve is considerably more steep now than it was a decade-plus ago. But it’s also worth noting that players aren’t suddenly bad at age 30. Recent research on aging curves suggest we might have been too harsh with a player’s decline in the past. I’m not suggesting players aren’t getting worse in their 30s, but good players in their 20s are likely to remain good players in their early 30s. On last season’s leaderboards, for example, six of the top-20 players and 16 of the top-50 players were between 30 and 33 years old. J.D. Martinez is only just turning 30 and likely still has several very good years ahead of him. Eric Hosmer still has two more seasons in his 20s before he turns 30. There are real concerns with Hosmer and Martinez. At some dollar amounts, the value isn’t going to be there. But both players also likely to play up to expectations for multiple years into a new contract. It’s possible teams are getting smart on long-term contracts, but two seasons ago, it was the Cubs and Red Sox who handed out the biggest contracts to a position player and pitcher, respectively; next season, meanwhile, the smartest teams in baseball are going to line up to pay all sorts of players into their mid-to-late 30s. There are a lot of reasons for the slow free-agent market, and avoidance of long contracts might be one of them, but there are probably other factors at work with this free-agent class that have a bigger impact.